Thank you NativeTech: Native American Technology & Art for making this info available. Make a paper pattern for moccasins first. 1. Place feet (or tracings) on either side of center line of paper with 1" between heels and edge of paper. Each heel should be 1/2" away from the center line, and the balls of the feet below the big toes should be 1/4" away from the center-line of the paper. 2. Even with the heels, mark points E and E1 (1/2" from the center-line and 1" from the edge of the paper) Also mark points D and D1 (1/2" from the center-line at the edge of the paper). 3. Mark point A by following a line from the base of the big toe to the center-line. 4. Draw curve around top of foot 1/2 " from toes from point A to just above little toe. 5. To find points B and B1, measure the circumference around the (widest part) ball of the foot and place half the distance on either side of the center-line where the ball of the foot is, mark this point. Now measure 1/2 " straight down and 1/2" straight out. 6. Finish drawing the curve around the top of the foot to point B and to point B1. 7. Drop an imaginary line straight down from each of the marked points for the circumference of the foot, this marks the bottom of the moccasin cuff at the heel. Another imaginary line connecting this point with point B shows where the cuff will be folded down at the ankle. 8. 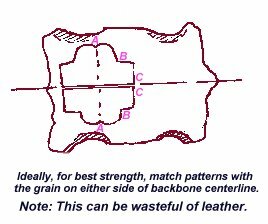 To draw the front corners of the cuff, draw a 2" line from point B, perpendicular to the imaginary fold-over line for the cuff. 9. Maintain a 2" cuff width to find point C at the rear corner of the cuff. Connect point C with point D at the heel by drawing a slight curve that intrudes no more than 1/4" from the edge of the paper. 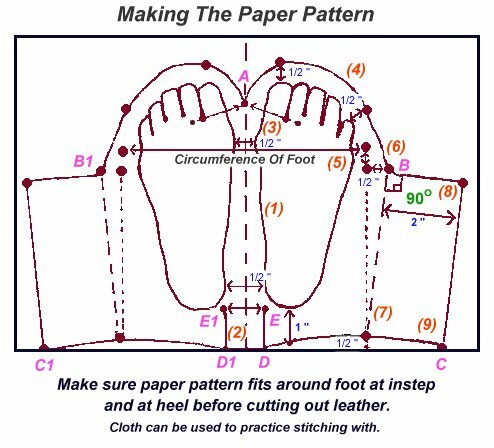 Make sure paper pattern fits foot around instep and at heel before cutting out of leather. After cutting out the paper pattern, fabric or felt can be used to practice stitching. 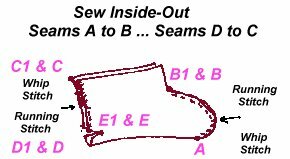 Sew inside out: Seam A to B/B1 and seam D/D1 to C/C1. Use a combination of whip stitch and running stitch (it's easier to pucker the toe using the running stitch). 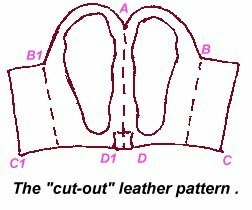 Cut slits (for heel tab) from D to E and D1 to E1 only after the toe is stitched, and proper fit is checked. Right side out, use the whip stitch in sewing the seam for the heel tab. Some variations in Trimming the Heel Tab. ATTACH THONG AT SEAM AT BACK OF ANKLE. Cut thong from a scrap of leather by cutting from the perimeter of the scrap, in a spiral, towards the center. Use the thong to keep the moccasin snug. 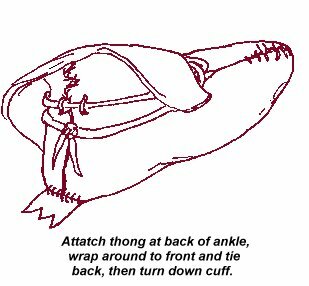 stitch the thong to two places at the back of the moccasin, or punch holes below the cuff, and wrap the thong around to the front and tie it in the back.